Made from grass-fed cows. Kosher. Promotes the production of bone, joint, hair, skin and nails. 454 grams. What are the benefits of Great Lakes Gelatin Hydrolyzed Collagen? Hydrolyzed Collagen from Great Lakes Gelatin is unique in its amino acid structure because of its high amounts of glycine, lysine, and proline, which are found in lower amounts in other protein food supplements. These particular amino acids are specifically needed by the body to build connective tissue structures and to regulate the functions of the cells because the body's natural ability to produce supporting amounts of connective tissue diminishes after the age of 25. 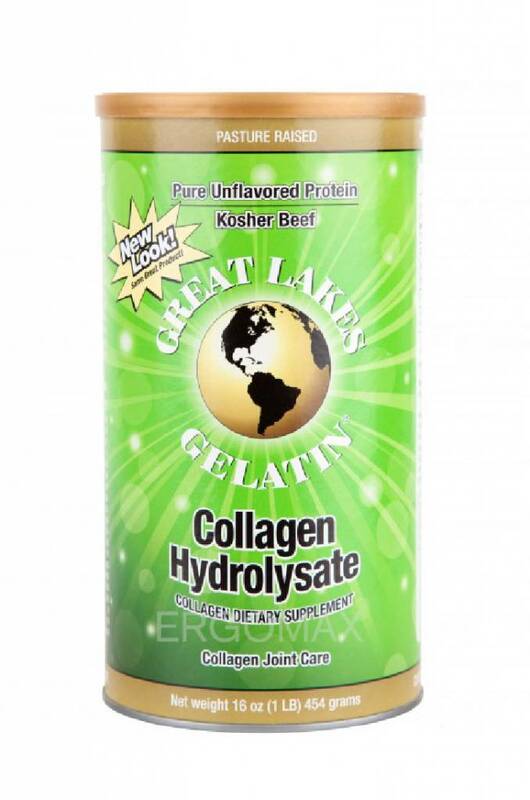 Hydrolyzed Collagen from Great Lakes Gelatin is the same collagen found naturally in bones, skin, and cartilage. It is a bioactive product containing 90% protein easily assimilated by the human body. It promotes rapid cell growth producing synovial fluids to first lubricate joints, then builds tissue. It is more easily digested because of its low molecular weight and is absorbed within 30 minutes. It will not congeal because it has been hydrolysed for quick assimilation and improved hydration to the connective tissue. 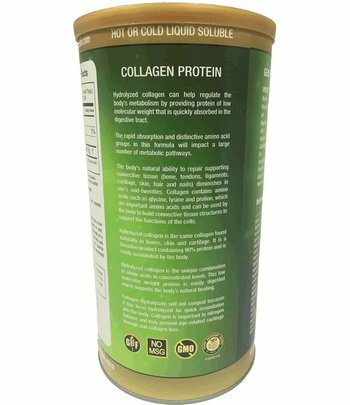 Collagen is important to nitrogen balance, now considered an anti-ageing product as it prevents age-related cartilage damage and collagen loss. Kosher produced. Non-GMO. No MSG. 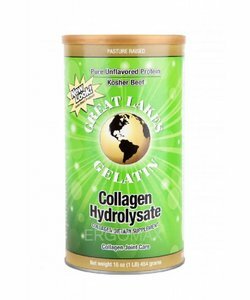 Hydrolyzed Collagen from Great Lakes Gelatin is the unique combination of amino acids in concentrated levels that promotes the rapid reproduction of blood cells for healing and conditioning over other proteins especially for bone and joint health care. 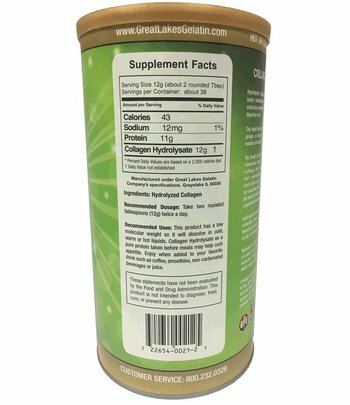 Hydrolyzed collagen helps regulate the body's metabolism by providing pure protein of low molecular weight that is quickly absorbed in the digestive tract. 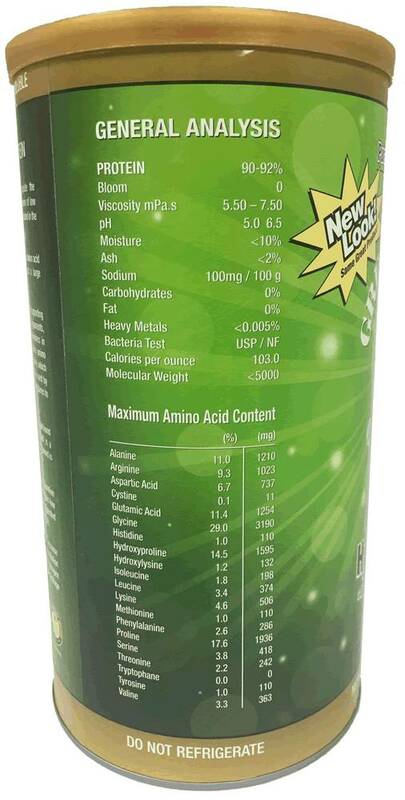 All of the amino acids collectively are beneficial to cell reproduction, but it is the distinctive spectrum of this product that impacts the metabolic pathways to healthy tissue. 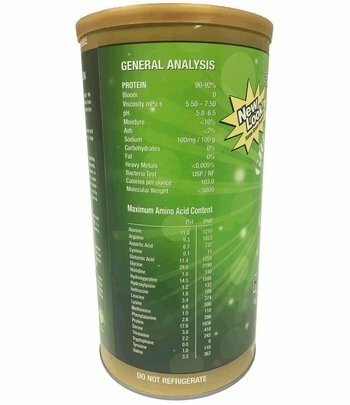 Great Lakes Gelatin Collagen Hydrolysate is a dietary supplement in the proteins category. Suggested Use: Take 2 tablespoons in the morning and 2 tablespoons before going to bed late evening, which will help reduce appetite. This product has a low molecular weight so it will dissolve in cold, warm, or hot liquids. It will not congeal because it is hydrolysed. 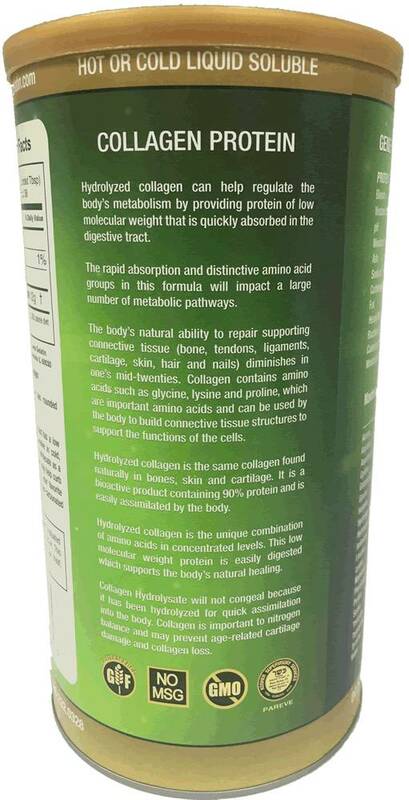 What is the Amino Acid Profile of Great Lakes Gelatin Hydrolysed Collagen?